2. Place the pan over moderately low heat and continue to whisk at a reasonable speed, reaching all over the bottom and insides of the pan where the eggs tend to overcook. To moderate the heat, frequently move the pan off the burner for a few seconds, and then back on. (If, by chance, the eggs seem to be cooking too fast, set the pan in the bowl of cold water to cool the bottom, then continue.) As they cook, the eggs will become frothy and increase in volume and then thicken. When you can see the pan bottom through the streaks of the whisk and the eggs are thick and smooth, remove the pan from the heat. 3. Add the soft butter in spoonfuls, whisking constantly to incorporate each addition before adding more. As the emulsion forms, you may add the butter in slightly larger amounts, always whisking until fully absorbed. Continue incorporating butter until the sauce has thickened to the consistency that you want. 4. Season the hollandaise sauce lightly with salt and a dash of cayenne pepper, whisking it well. Taste and adjust the seasoning, adding droplets of lemon juice if needed. Serve lukewarm. 5. Fill the pan with of 2 to 3 inches of warm water, add the vinegar, and bring to a slow boil. 6. Rapidly crack and open each egg into the water, holding the shell as close to the surface as possible. The eggs will cool the water; adjust the heat to maintain a slow simmer. After a few moments, when the whites have just begun to set, drag the back of the slotted spoon gently across the top of the eggs, to move them off the pan bottom so they don’t stick. Cook the eggs for about 4 minutes, adjusting the heat as necessary. 7. To test for doneness, lift 1 egg from the water with the slotted spoon and gently press both white and yolk. The whites should feel fully set but not too firm, and the yolks very soft. If you prefer firmer eggs, poach the eggs longer. 8. When the eggs are set the way you like them, remove the eggs from the saucepan with the slotted spoon or strainer and immerse them in a bowl of warm tap water to wash off the vinegar. Set the spoon on a clean towel (or folded paper towels) for a moment to remove excess water. Immediately assemble the eggs Benedict. 9. Just before serving, toast the bread circles or muffins lightly, butter both sides, and warm the ham or prosciutto in a frying pan with a tablespoon butter. 10. Center a toast round on each warm serving plate. Drape a slice of ham, prosciutto, or bacon over the toast and top it with a poached egg. 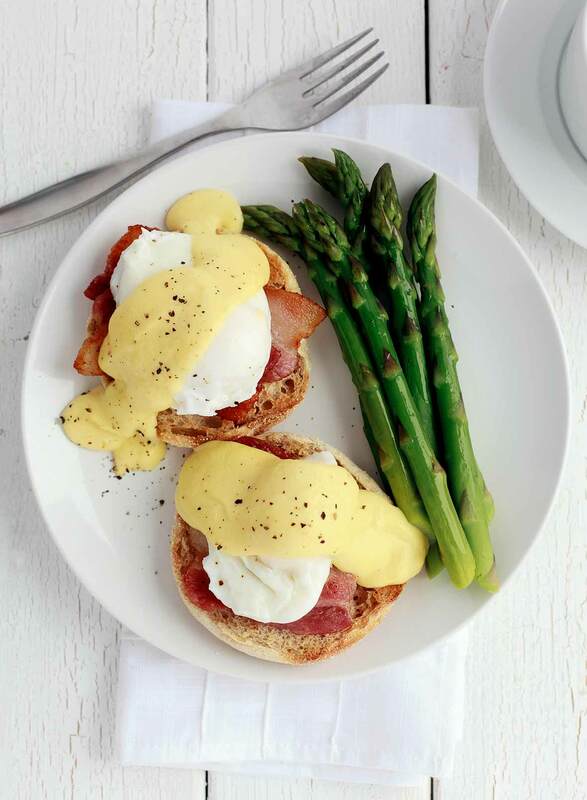 Spoon some hollandaise sauce generously over each egg and top with a few grinds of black pepper. Serve immediately. The name sounds fancy-dancy and trés too-too, but it’s really just a simple substitution. Instead of using prosciutto, ham, or bacon (US or Canadian), swap in slices of smoked salmon. Then just spoon on the Hollandaise sauce, and you’re brunch-ready. 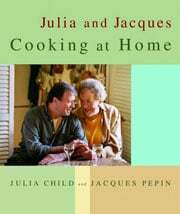 Julia Child's Eggs Benedict Recipe © 1999 Julia Child and Jacques Pépin. Photo © 2013 nicolesy . All rights reserved. All recipes and photos used with permission of the publisher.